While the Knicks court and await word from Marcus Camby, they've separately agreed to bring back one of their own. 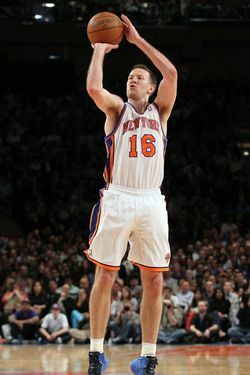 Steve Novak — sharpshooter extraordinaire, MSG favorite, and Early Bird–rights victor — will re-sign with the Knicks on a four-year, $15 million contract. NBA free agency is still technically in the "moratorium" period, so Novak can't sign his contract until Wednesday. It'll obviously be wonderful to have Novak back with the team. He is arguably the best pure shooter in the NBA right now, and his combination of baffling accuracy and goofy celebrations made him a sort of cult hero last season. Of course, Novak doesn't do much else besides shoot, and the Miami Heat showed during the playoffs how that single weapon can be neutralized with an attentive defense. Then again, Novak didn't play much alongside a competent point guard during that series, and he should have both Jeremy Lin and Jason Kidd feeding him for the next few years. There will be many more threes. Regarding the contract: Almost $4 million a year for Novak might be a little much, but with the Knicks already headed into luxury tax territory in the near future, the money hardly matters. The one possible issue with the contract is that the fourth year isn't an option. In 2015, when the contracts of Carmelo Anthony, Tyson Chandler, and Amar'e Stoudemire all expire and Jeremy Lin's has a team option, Novak will still be locked in with the Knicks. Hopefully that's a good thing.